Iran and Saudi Arabia have been regional rivals for more than three decades. Most recently, Saudi Prince Mohammed bin Salman said it was impossible for Riyadh to have a dialogue with Tehran. "Its (Iran's) logic is that the Imam Mahdi will come and they must prepare the fertile environment for the arrival of the awaited Mahdi and they must control the Muslim world,” he said in a televised interview on May 2, 2017. Iranian Foreign Minister Mohammad Javad Zarif, however, said his country is open to engaging with the Sunni kingdom. “We have never ruled out intermediary efforts. Pakistani, Indonesian, Kazakh and Russian officials have given proposals to mediate and we did not oppose. We are not seeking clashes with Saudi Arabia and the problem is not mediators. What is essential is a change in attitude of the Saudi officials,” he said in an interview with the Iranian Students’ News Agency. Tensions date back to the 1979 Iranian revolution. The Saudi monarchy, which based its legitimacy on Islam, felt its dominance threatened by the establishment of the Islamic Republic. Relations were strained throughout the 1980s, as Saudi Arabia quietly supported Iraq during the Iran-Iraq war. Tensions eased slightly under President Akbar Hashemi Rafsanjani (1989-1997) and Mohammad Khatami (1997-2005), who sought to improve Iran’s relations with its neighbors. But movement towards rapprochement stalled in 2005, when President Mahmoud Ahmadinejad came to power and reverted to a hardline stance on foreign policy. The Arab Spring in 2011 further aggravated tensions, especially in Bahrain, where Shiites protested against the Sunni royal family. Saudi Arabia sent troops to quell the uprising and blamed Iran for provoking the unrest. Tehran has been trying to improve relations with Riyadh since President Rouhani’s election in 2013. But the two countries have clashed over regional conflicts, particularly in Syria and Yemen. And in September 2015, hundreds of Iranians were killed in a stampede during the annual hajj ritual in Saudi Arabia. Tehran accused Riyadh of mismanagement, and Saudi officials accused Iran of playing politics in the aftermath of the tragedy. After Saudi Arabia executed Shiite cleric Nimr al Nimr in January 2016, protesters attacked the Saudi embassy in Tehran. As a result, Saudi Arabia severed diplomatic ties with Iran. The following is a timeline of Iran-Saudi relations since the 1979 revolution. 1980-1988: Iraq invades Iran, prompting an eight-year war. Saudi Arabia remains publicly neutral, but reportedly makes three of its ports available to ship military equipment to Iraq. 1981: Iranians clash with Saudi police after chanting political slogans in Mecca and Medina. Iranian officials accuse Saudi authorities of discriminating against Iranian pilgrims. May 1981: Six Gulf states – Saudi Arabia, the United Arab Emirates, Qatar, Kuwait, Oman, and Bahrain – form the Gulf Cooperation Council, in part as a security response to the Iranian revolution and the Iran-Iraq war. May 1984: Iran attacks a Saudi oil tanker in Saudi waters, in retaliation for Iraq’s attempts to interfere with Iran’s oil shipping. Saudi Arabia shoots down an Iranian Phantom jet over Saudi waters. 1987: Shiite pilgrims clash with Saudi police during the annual hajj, resulting in a stampede. At least 400 people are killed in the clashes, including more than 200 Iranians. In response, Iranian protesters attack the Saudi and Kuwaiti embassies in Tehran. 1988: Saudi Arabia severs ties with Iran over the hajj clash. 1988-1990: Iran boycotts the hajj after Saudi Arabia reduces the number of Iranian pilgrim visas in response the clashes in 1987. 1990: Saudi Arabia sends aid to Iran after an earthquake kills 40,000 people. 1991: Riyadh and Tehran restore diplomatic ties. 1989-1997: Akbar Hashemi Rafsanjani is elected president and takes a more conciliatory stance towards Saudi Arabia and other Gulf countries. Trade and direct flights between the two countries increase. 1997-2005: President Mohammad Khatami comes to office and introduces a period of outreach to the Gulf. But Saudi officials grow wary of Iran’s growing influence in Iraq after the U.S.-led invasion toppled Saddam Hussein in 2003. 1997: Crown Prince Abdullah attends the Organization of Islamic Conference summit in Tehran, becoming the most senior Saudi official to visit Iran since 1979. 1999: Iranian President Khatami meets with Crown Prince Abdullah in Saudi Arabia. He is the first leader to visit Saudi Arabia since 1979. 2001: Iran and Saudi Arabia sign a security pact on terrorism and drug trafficking. 2005-2013: President Mahmoud Ahmadinejad comes to power and takes a more hardline stance on foreign policy. Tehran and Riyadh increasingly seek to boost their regional influence through proxybattles in Lebanon, Palestine, Iraq, and Afghanistan. 2011: The Arab Spring fuels bilateral tensions. Saudi officials accuse Iran of inciting protests inBahrain against the country’s Sunni royal family. The kingdom sends 1,000 troops to quell the uprising. 2011: The U.S. Justice Department charges two Iranians with attempting to murder Saudi Ambassador to the United States Adel al Jubeir. 2012: A series of protests against anti-Shiite discrimination erupt in Saudi Arabia’s Eastern Province. Saudi Arabia blames Iran for the protests. 2014: Saudi authorities issue a death sentence for Nimr al Nimr, a Shiite cleric involved in the 2011 protests. Iranian officials denounce the conviction. March 2015: Saudi Arabia begins a bombing campaign in Yemen. Riyadh claims the airstrikes are a response to Iranian support for the Houthis, a Zaydi Shiite movement that took over large parts of the country in 2014. But the exact degree of Iranian support for the Houthis is debated. July 2015: Iran and the world’s six major powers reach a deal over Iran’s controversial nuclear program. Saudi officials publicly endorse the deal, despite past reservations. September 2015: A stampede in Mina during the annual hajj kills at least 2,000 people, including hundreds of Iranians. Tehran accuses the Saudi government of mismanagement and threatens legal action. November 2015: Iran and Saudi Arabia both attend Syrian peace talks in Vienna, along with more than a dozen other nations. Iranian Foreign Minister Mohammad Javad Zarif and his Saudi counterpart, Adel al Jubeir, reportedly get in a heated argument during the talks. January 2016: Saudi Arabia executes Sheikh Nimr al Nimr, a prominent Shiite leader who supported anti-government demonstrations, along with 46 others for alleged terror-related offenses. The move prompts protests or condemnation from Shiites in Iran, Iraq, Bahrain, Turkey, Pakistan, India, Lebanon, and Yemen. In Iran, protestors burn part of the Saudi Embassy in Tehran and storm the compound. Demonstrators try to attack the Saudi Consulate in Mashhad. Saudi Arabia, Sudan, Bahrain, and Djibouti sever diplomatic ties with Iran. And the UAE downgrades its relations with the Islamic Republic. Iran had barred its pilgrims from traveling to Mecca to take part in the annual Hajj after claiming Saudi Arabia had failed to guarantee the safety of its citizens. This was primarily in response to the Hajj stampede that occurred the previous year and resulted in the deaths of hundreds of people, most of which were Iranian. September 2016: Iranian Supreme Leader Ayatollah Ali Khamenei accuses the kingdom of “murdering” pilgrims during the 2015 Hajj. Khamenei criticizes Saudi management of the pilgrimage, calling on Iranians and other Muslims to hold them accountable. “The stampede demonstrated that this government is not qualified to manage the Two Holy Mosques,” said the Supreme Leader. Iranian Foreign Minister Mohammad Javad Zarif then responded via Twitter. Khamenei also took to Twitter to accuse the Saudis of “depriving” Iranians of the opportunity to attend the Hajj. March 2017: Saudi Arabia announces that Iranian pilgrims will attend and participate in this year’s annual Hajj after an absence in 2016 due to tensions between the two countries. “The ministry of Hajj and the Iranian organization have completed all necessary measures to ensure Iranian pilgrims perform Hajj 1438 according to the procedures followed by all Muslim countries,” the official Saudi Press Agency said. March 14: Saudi Deputy Crown Prince Mohammed bin Salman meets with U.S. President Donald Trump at the White House. A senior adviser tells Bloomberg that the two leaders both opposed “Iranian expansionist moves in the region” and support for terrorist organizations. On the same day, Iranian Foreign Minister Mohammad Javad Zarif reveals that Pakistani, Indonesian, Kazakh and Russian officials had offered to mediate between Iran and Saudi Arabia and that Tehran was open to dialogue. May 4, 2017: Iran’s U.N. ambassador, Gholamali Khoshroo, sends a letter to U.N. Secretary General Antonio Guterres and Security Council President Elbio Rosselli describing Prince Salman’s remarks as “unlawful and inflammatory.” He asks Guterres to circulate the letter as a document of the U.N. Security Council. The following is the full text. We all – including Saudi authorities -- need to be reminded of the fact that this misplaced obsession and insecurity lead to the Kingdom’s unreserved support and financing of Saddam Hussein’s aggression against Iran from 1980 to 1988, whose devastating consequence was not confined to the hundreds of thousands of Iranians who became victims of Saddam’s aggression and use of chemical weapons, but engulfed the entire region after his invasion of Kuwait and threats against KSA, biting the hands that had fed and sustained him. May 7, 2017: Iranian Defense Minister Brigadier General Hossein Dehqan responded to Prince Salman’s comments in an interview with Al Manar TV. “We recommend them (Saudis) not to make any ignorant move, but if they do, we will not leave anywhere intact except Mecca and Medina,” he said. Late May 2017: President Trump visited Riyadh, where he signed a $110 billion arms deal. In a joint statement, Saudi Arabia and the United States “agreed on the need to contain Iran’s malign interference in the internal affairs of other states, instigation of sectarian strife, support of terrorism and armed proxies, and efforts to destabilize the countries in the region.” After Trump’s visit, Iranian leaders harshly criticized Saudi Arabia’s regional policies. May 27, 2017: Supreme Leader Khamenei condemned Saudi Arabia for trying to “gain the friendship of Islam’s enemies” (e.g., the United States) but dealing harshly with Muslims. “They oppress their own people in this manner, and oppress the people of Yemen and Bahrain in other ways. But they are going to perish,” he said in a speech marking the start of the holy month of Ramadan. June 5-22, 2017: Saudi Arabia, the United Arab Emirates, Bahrain and Egypt cut diplomatic relations and imposed trade and travel bans with Qatar for its alleged support for terrorism. The group issued 13 demands for Qatar to resolve the dispute. The demands included shutting down diplomatic posts in Iran, expelling members of the IRGC and only conducting trade and commerce with Iran that complied with U.S. sanctions. June 7-11 2017: At least 12 people were killed and 46 were wounded in twin terror attacks on the Iranian Parliament and the tomb of Ayatollah Khomeini. This Islamic State claimed responsibility, but Iranian officials blamed Saudi Arabia for the attacks, pointing to Mohammed bin Salman's May remarks threatening to bring the battle to Iran. Iranian Foreign Minister Javad Zarif accused Riyadh of being "actively engaged" in supporting militants inside Iran days after the attacks. Such crimes that show foul play & humiliation of perpetrators & their masters are too small to interfere w/Iranian nation's determination. Saudi's Foreign Minister Adel al Jubeir rejected the accusations. "We condemn terrorist attacks anywhere they occur, and we condemn the killing of the innocent anywhere it occurs," Jubeir said. The Islamic Revolutionary Guard Corps vowed revenge. "World public opinion, especially in Iran, sees the fact that this terrorist act was perpetrated soon after the meeting of the US president with the heads of one of the reactionary regional states that has always supported ... terrorists as to be very meaningful," the IRGC statement said, tying the attacks to Trump's May visit to Riyadh. June 17-22, 2017: The Saudi Arabian coastguard fired on Iranian fishing boats in the Gulf, killing one fisherman and arresting three, according to Iranian media. Two Iranian boats were fishing in Persian Gulf waters and were pushed off course by waves, an interior ministery official said. "We are pursuing this matter to determine if the Iranian boats had crossed the Saudi border or not, but the action of the Saudis does not comply with humanitarian and navigational principles," said an Iranian border affairs official. Iran called on Saudi Arabia to release three fisherman it detained in the incident and pay compensation for the death of another fisherman. Saudi Arabia claimed the fishermen were actually IRGC members with a boat of explosives. "It is clear this was intended to be a terrorist act in Saudi territorial waters designed to cause severe damage to people and property," the Saudi ministry said in a statement. June 24, 2017: Iran condemned a suicide bombing near the Grand Mosque in Mecca, offering assistance in combatting terrorism. August 13, 2017: Saudi Arabia asked Iraq's prime minister to mediate between Tehran and Riyadh. "During our visit to Saudi Arabia, they also asked us to do so, and we said that to [the] Iranian side. The Iranian side looked at this demand positively," Iraq's interior minister said. Mid-August 2017: Iran sent pilgrims to the the haj pilgrimage to Mecca for the first time in two years. August 23, 2017: Iranian Foreign Minister Javad Zarif said Iran and Saudi Arabia would exchange diplomatic visits potentially after the conclusion of the haj pilgrimage in the first week of September. "The visas have been issued for both sides to make this trip," Zarif told Iranian media. "We are waiting for the final steps to be completed so diplomats from the two countries can inspect their embassies and consulates." August 30, 2017: Iranian President Rouhani accused Saudi Arabia of supporting terrorists in Yemen and Syria. "Saudi Arabia's intervention in Yemen and their support of terrorists in Yemen and Syria are main hurdles to improve ties between Tehran and Riyadh. Saudi Arabia should stop backing terrorists," Rouhani said. September 5, 2017: Saudi Foreign Minister al Jubeir rejected the idea of Iranian rapprochement, despite Iranian Foreign Minister Javad Zarif’s claim last month that diplomatic visits would occur between the two countries in September. Iran would have to change its policies before relations could improve, al Jubeir said. October 13, 2017: Saudi Arabia supported President Trump’s decision to de-certify the nuclear deal, citing the move as a way to confront Iranian aggression in the region. November 2017: Saudi Arabia charged Iran with an act of war for a missile fired at the Saudi capital by the Houthis in Yemen. Iran denied any links to the attack. "The Saudis who have not been able to attain their ominous goals in the long war and military aggression put themselves in more bottlenecks using naïve and improper psychological operations by raising stupid, baseless and fully false allegations," Foreign Ministry Spokesman Bahram Qassemi said. Iranian officials instead blamed to Saudi aggression in Yemen. "How should the Yemeni people react to bombardment of their country. So they are not allowed to use their own weapons? You stop the bombardment first and see if the Yemenis would not do the same,” President Hassan Rouhani said. But remnants of four ballistic missiles fired into Saudi Arabia by the Houthis on May 19, July 22, July 26 and November 4, 2017 appear to have been designed and manufactured by Iran, according to a confidential U.N. report from November 2017. December 2017: Yemeni Houthi rebels fired another missile at Saudi Arabia, but it was intercepted by Saudi's air defense system before it reached Riyadh. "This hostile and indiscriminate act by the Iran-back Houthi armed group proves the continued involvement of the Iranian regime in supporting (the) Houthi armed group with qualitative capabilities," a Saudi spokesman said. Iran denied the allegations. January 16, 2018: Houthi rebels said they fired a short-range ballistic missile toward a regional airport in the Saudi border province of Jizan. Saudi defense forces said they shot down the missile over Jizan. "This hostile action by the Houthi group, which is backed by Iran, proves the Iranian regime's continuous support for the armed Houthi group by providing them with capabilities, which is in violation of UN resolutions," said spokesman for the Saudi-led coalition, Colonel Turki al-Malki. February 2018: Saudi Arabia supported a UN draft resolution by the United States, Britain and France that would condemn Iran for failing to stop Yemen's Houthi rebels from obtaining ballistic missiles. Saudi Foreign Minister Adel al Jubeir said the resolution would help hold Iran accountable for its "radical and aggressive behavior" in the region. 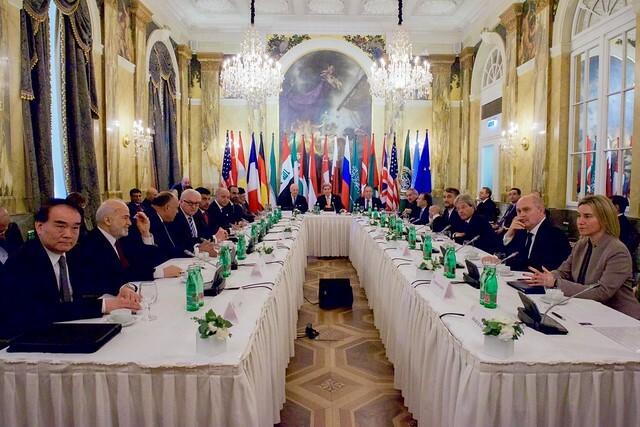 “In order to ensure than Iran comports itself with international law, we must have firmer positions with regards to ballistic missiles and with regards to Iran’s support for terrorism,” al-Jubeir said a the Munich Security Conference. “Iran must be held accountable." Jubeir also blamed Iran for heightening regional tensions and called for a fundamental change in the Iranian regime. "We didn't attack Iran," Jubeir said. "Iran is the one that is attacking us. Iran has started to undermine Lebanon, Syria, Iraq, Bahrain, Yemen, Pakistan, Afghanistan, including countries in Africa." "The US and its local clients in our region are suffering from the consequences of their own wrong choices," Iranain Foreign Minister Javad Zarif responded. "But they use this and other fora to revive the hysteria on Iran's foreign policy and try to obscure its realities." Later in the month, Zarif accused Saudi Arabia of war crimes in Yemen on Twitter. March 15, 2018: Saudi Arabia said it will develop nuclear weapons if Iran does so. “Saudi Arabia does not want to acquire any nuclear bomb, but without a doubt if Iran developed a nuclear bomb, we will follow suit as soon as possible,” Prince Mohammed bin Salman said in a CBS interview. Iranian Foreign Ministry Spokesman Bahram Qassemi blasted the crown prince for his remarks. “He has no idea of politics apart from bitter talk that emanates from a lack of foresight ... His remarks do not deserve a response, because he is a delusional, naive person, who never talks, but with lies and bitterness,” Qassemi responded. March 29, 2018: Saudi Crown Prince Mohammed bin Salman called for more economic and political pressure on Iran, saying it was needed to avoid a direct military confrontation in the region. "We have to succeed so as to avoid military conflict," Prince Mohammed told the Wall Street Journal. "If we don't succeed in what we are trying to do, we will likely have war with Iran in 10-15 years." It's official: Supplying bombs, targets and refueling #Saudi warplanes is apparently not enough. US now proclaiming that it's "doing the planning" in war on #Yemen too. US complicity in world's biggest humanitarian disaster unfathomable. April 9, 2018: Iranian Defense Minister Amir Hatami responded to Saudi Arabia's late March comments in the Wall Street Journal, saying the crown prince had fallen into the trap of the illusion of power. "Those words have been said by a man who has little experience in state affairs," Hatami said. "Hitler acted under an illusion of power, believing himself to be strong. So did Saddam Hussein [when he attacked Iran in 1980]. When the Americans attacked Iraq, they too had this delusion of power and strength. They thought they would occupy Iraq, appoint a new ruler and that would be it. But in all important issues they have failed miserably and plunged the country into the deepest hell." Aprili 10-11, 2018: In a visit to France, Saudi Crown Prince Mohammed bin Salman accused Iran of supporting terrorism in the region. “Saudi rulers have made themselves as notorious as Zionist regime’s officials in being epitomes of crime and aggression in the region,” Bahram Qassemi said in response.“Those who have placed their names and countries in the list of the murderers and aggressors of the region and are considered the same with notorious aggressive and murderous dictators of the region like Saddam should know that levelling baseless and illusionary accusations or bringing up hallucinatory claims will not change the fact that the countries and nations of the region along with whoever who monitors regional developments, are aware of Saudi Arabia’s role in creating, spreading, and arming extremist pro-violence terrorists who have emerged in different eras with different names like Al-Qaeda, ISIL and so forth and have committed numerous murders and humanitarian catastrophes in some neighboring, regional, and world countries," he added. "The current Saudi rulers, along with the Zionist regime, have become the symbols of crime and aggression in the Middle East and they have added up to instability and regional woes by interfering in the domestic affairs of other countries of the region." April 14, 2018: Supreme Leader Ayatollah Khamenei accused the United States of creating ISIS with Saudi money. The U.S. played a major role in creating #ISIS, they entered where ISIS was trapped to save them. They raised the wicked creatures [ISIS] with Saudi money, turning them [ISIS] lose on Iraqi and Syrian nations; but, resistance against the US and their agents saved these countries. April 30, 2018: Following U.S. Secretary of State Mike Pompeo's visit to Riyadh, Supreme Leader Ayatollah Khamenei accused the United States of encouraging Saudi Arabia to confront Iran. "One of the ways to confront Iran is to provoke inexperienced rulers of the region," said the supreme leader. "Americans are trying to provoke Saudi Arabia against Tehran ... Their aim is to create more regional crisis ... to push Muslims to fight against Muslims. If these governments gain more wisdom, they will not confront Iran. If they confront Iran, they will be defeated." Iranian Foreign Ministry Spokesman Bahram Qassemi also weighed in, saying the U.S.-Saudi relationship destablized the region. "The cooperation between America and Saudi Arabia will further destabilize the Middle East and will lead to more crisis in the region," Qassemi said. U.S. officials agitate Saudis, creating discord and chaos in West Asia. Why don't you agitate the Zionists? Because they want to turn Muslims against one another; thus, avoiding the burden of an outcome from confronting the Islamic Republic and the powerful Iranian nation. May 3, 2018: In a YouTube video criticizing the Iran nuclear deal, Iranian Foreign Minister Zarif cited defense spending by Saudi Arabia and alluded to its support for terrorism. "We still spent a fraction of countries like Saudi Arabia and the United Arab Emirates on defense. And our missiles have a shorter range than those of Saudi Arabia," Zarif said. "And unlike U.S. allies in the region, who have brainwashed, financed and armed groups such as al Qaeda, the Taliban and the ISIS, we have been pivotal in defeating these extremist thugs." May 9, 2018: Saudi Arabia supported President Trump's decision to withdraw the Iran nuclear deal. "The Iranian regime however, took advantage of the economic benefits afforded by the lifting of sanctions and used them to continue its destabilizing activities in the region, especially by developing its ballistic missiles and supporting terrorist organizations in the region, including Hizbollah and the Houthi militias, which used the capabilities provided by Iran to target civilians in the Kingdom of Saudi Arabia and Yemen, as well as, repeatedly targeting international shipping lanes in a blatant violation of UN Security Council resolutions," the foreign ministry statement said. Saudi Foreign Minister Adel al Jubeir said his country would do "whatever it takes" to protect its people, including acquiring a nuclear capability if Iran does. May 26, 2018: Saudi Arabia froze new business with Germany in response to Berlin's pro-Iran policies and accusations that Saudi Arabia's foreign policy constitutes "political adventurism." Click here for more information on Iran’s relations with the Gulf states. * Bulloch, John; Morris, Harvey (1989). The Gulf War: Its Origins, History and Consequences (1st published ed.). London: Methuen.